In today’s society working one job is barely enough to cover your monthly living expenses as well as your mountain of debt. Many people choose to relieve some of the stress of not having enough income by taking out payday loans in order to cover important bills such as rent or a car payment. In addition, many Americans are living from paycheck to paycheck. Therefore, taking out a payday loan seems very practical. Some people take multiple payday loans out to cover an existing outstanding payday loan that’s due. When your payday loans are fully paid, you still can become a victim of payday loan scams. When you apply for payday loan online, your information becomes either hacked or used for marketing purposes. If you do not apply to a payday loan on a secure website, then you may risk having your personal information such as your name, birthday, and address used by other agencies that are trying to scam you out of taking your money. In most cases when you apply online you put your personal information into a lead generator which collects your data and sells it to payday loan companies and or scammers, and from there your information is trapped in an unsecured system. Once your personal information is sold to a scammer that is when you will start to receive false debt collection calls. Some scammers go through great lengths to pose a debt collection company. Scammers will become very creative in how they utilize their threatening intimidation tactics in order to get you to make a payment or payoff your debt in full. 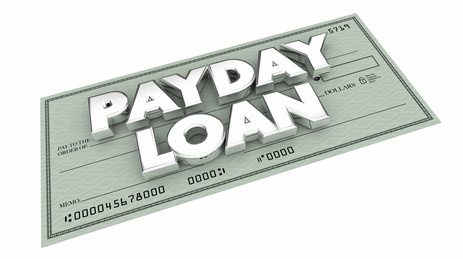 One of the most common intimidation tactics is when a fake payday loan collector calls you and reports that you have failed to pay your payday loan and as a result you will either sued, authorities will show up at your residence, visit your employer, may be arrested, levy your bank account, or garnish your wages. In these circumstances people become fearful of the repercussion and they are tricked psychologically into thinking how can I avoid these consequences without ever thinking about the fact that they are clear of debts owed to any payday loan company. So as a result they give up their account information and make a payment or pay off their debt in full to a false creditor. False creditors will be very persistent in collecting money when they have your personal information. So it is important that if you have taken out debt before, make sure you know the companies name, the name of the caller and employee number, also the companies address. A rule of thumb is to make sure you document all payment transactions to ensure your payday loan has been paid in full. You can avoid being scammed by having the caller give his name, company address, and employee identification number, then research the company phone number online to see if it’s legitimate; often times scammers avoid these request. You can validate and or find out more information about the company through the Better Business Bureau. Lastly, if you were a victim of a payday loan scam, you should file a complaint with the Federal Trade Commission and your state Attorney General’s office.